San Jose, CA—San Jose’s Cafe Stritch, formerly Eulipia Restaurant, continues its heritage of presenting cutting-edge jazz and art by mounting a show of famed jazz photographer Kathy Sloane’s powerful, atmospheric portraits of jazz greats. In 2011 The University of Indiana Press published Sloane’s book Keystone Korner: Portrait of a Jazz Club, now in its second printing. The book was recommended by The Library Journal, Downbeat and JAZZIZ magazines, and was awarded Book of the Year Award: Gold (Performing Arts) by ForeWord Reviews. The photos in the exhibition are drawn in part from her acclaimed book and also include other jazz photos from her 30-year career. 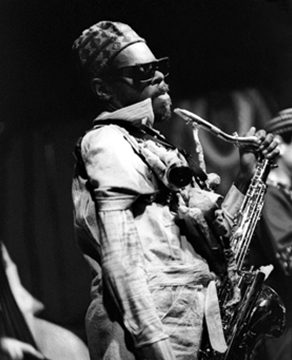 The exhibit will coincide with Cafe Stritch’s Rahsaan Roland Kirk Tribute Week (August 7 – August 11). Kirk’s “Theme for the Eulipions” gave Eulipia its name in 1977, and the restaurant’s owners (as well as their children, current owners of Cafe Stritch) carry on the tradition of reverence for Rahsaan Roland Kirk and jazz. Trombonist Steve Turre, who played for many years with Kirk, will be playing at Café Stritch on August 8, 9, and 10, and Kirk’s widow Dorthaan will attend all of the activities during Cafe Stritch’s weeklong tribute to her late husband. Sloane began her life as a self taught photographer in San Francisco’s Keystone Korner Jazz Club in 1976, drawn to the music of improvisation, beauty and resistance that for her became a metaphor for the struggles of the 1960s in which she had participated as a literature and writing teacher. For 37 years she has committed herself to photographing the multicultural life of the Bay Area with the task of understanding and depicting the myriad ways in which various communities give meaning and value to all our lives. Opened in March, 2013, Café Stritch was named for an iconic saxophone used by Rahsaan Roland Kirk, the jazz great whose composition “Theme for the Eulipions” gave rise to the name Eulipia, the white tablecloth restaurant and jazz club that preceded Cafe Stritch in the same location in the heart of San Jose’s SoFA arts district at 374 South First Street, (408) 280-6161. Cafe Stritch presents live entertainment a minimum of five nights each week including jazz, indie, folk, and DJ’s. Beverages include a variety of craft beer, specialty cocktails, and a full service coffee bar serving offerings from recently founded local coffee roaster Chromatic Coffee Company. The food menu features large and small plate affordable offerings including fried chicken & waffles, hamburger sliders, jambalaya, salads and a variety of house-made soups.